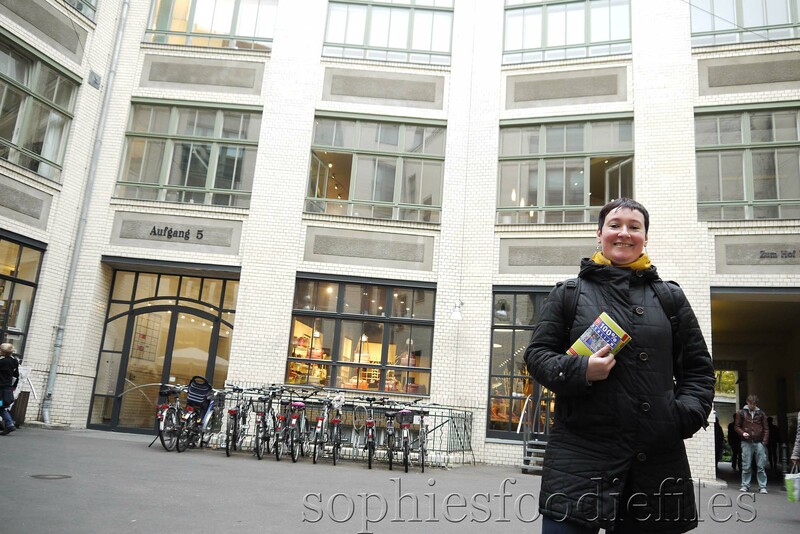 Travelling Sophie: Berlin part 1! Hello , my friends! I am back from my Berlin vacation! We had lots of fun, travelling, walking, eating, drinking, discovering new things & buildings,etc! I will tell you about it in a few travelling Sophie posts! I will share not my whole vacation with you but I chose my favourite food cafés, lovely neigbourhoods, good restaurants & favourite shops, etc, not all food like! So, here we go. This is part 1! The 1st day, my husband Peter & I travelled on foot & with the U-bahn. This is a sort of metro, underground network, which is very functional. We saw the Brandenburger Tor, we walked hand in hand in Unter den Linden & went for a late lunch in Jedermann’s. It is situated on Unter den linden, number 12, 10117 Berlin. 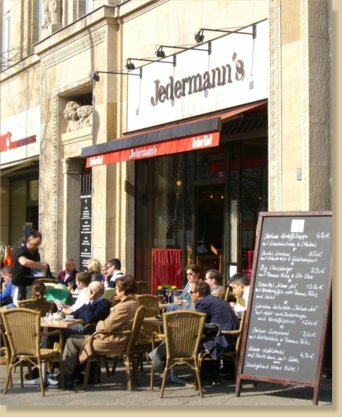 The outside of Jedermann’s Berlin! I didn’t take any pictures but our food was delicious. 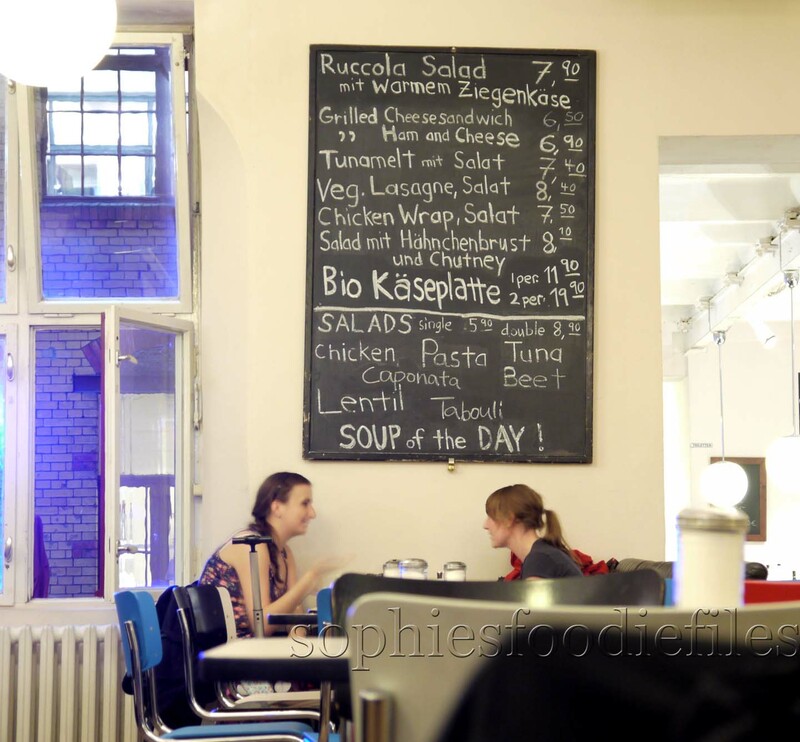 This restaurant is famous for their Berliner foods, aka dishes & they work seasonal too. There is also a cozy atmosphere in this lovely restaurant. There were lighted candles on every table. 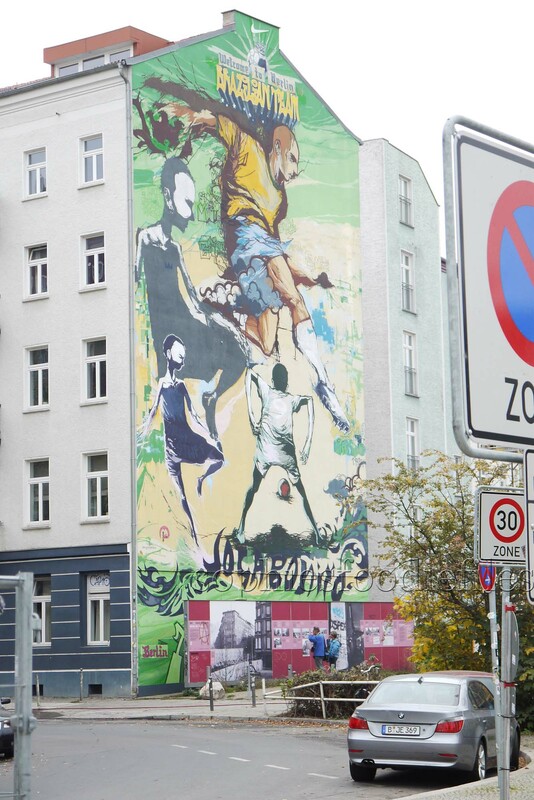 The walls were decorated with Berlin highlights. I had a big piece of Quiche Lorraine, fresh from the oven with a lovely side salad. Peter drank a Berliner Kindl with it. It is a Berlin beer, 0.5 litre. I had 1 litre of Vittel water. Peter had the vegetarian cannelloni stuffed with spinach & cottage cheese with a side salad & it was superb. This costed us in total nearly 24€. This is a soft normal pills beer. 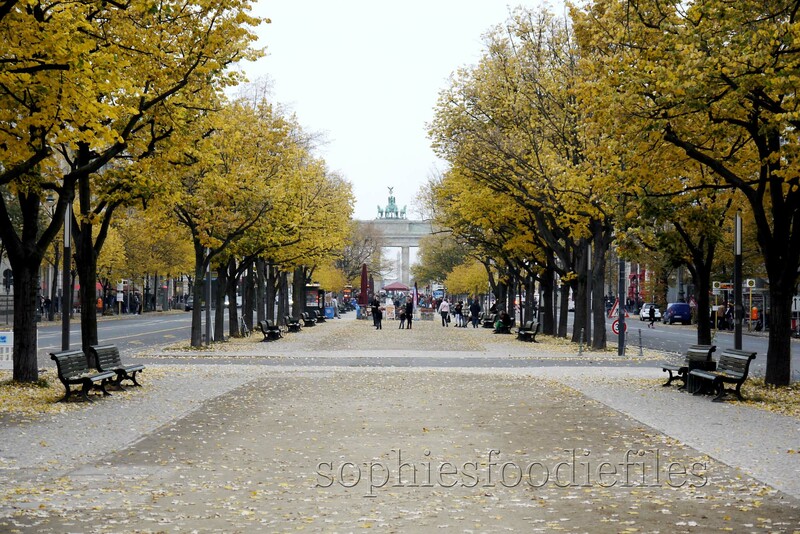 Unter Den Linden in Fall time! At the end: The Brandenburger Tor! We had a great time, travelling our 1st day in Berlin. We saw a lot of different highlights & went into the U-bahn to different area’s in this glorious & very cool city. 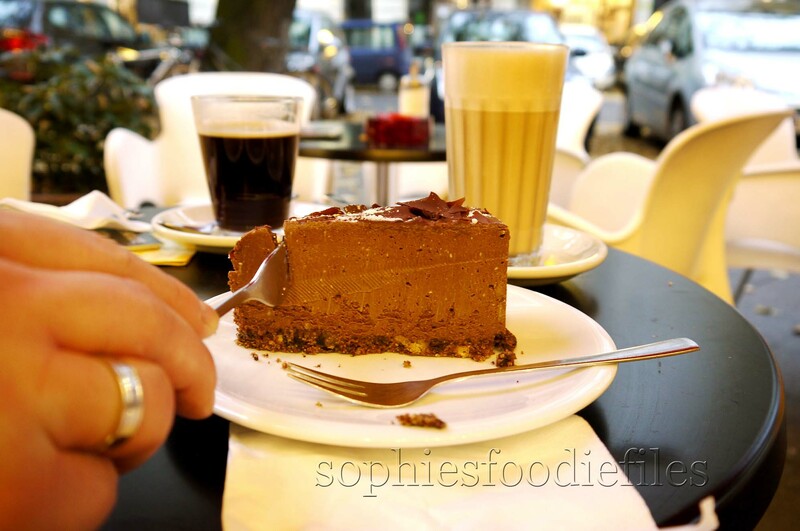 Berlin is also famous for their cafés & kuchen. 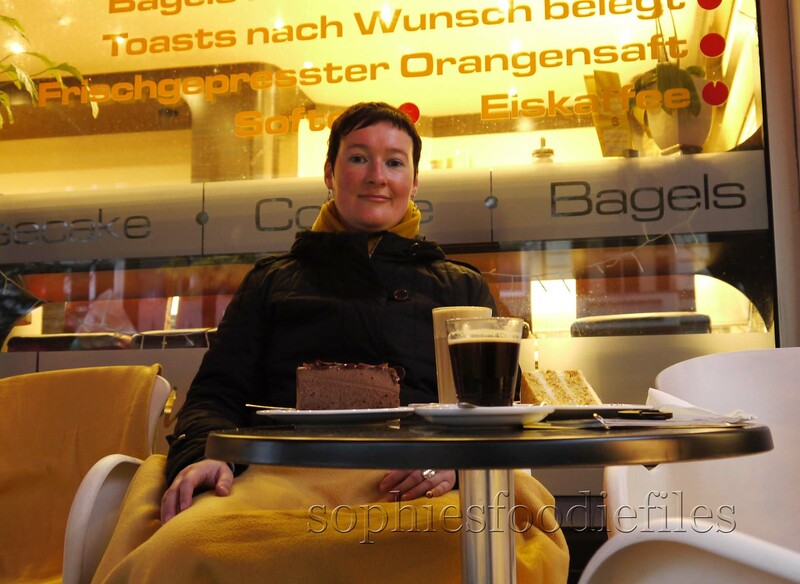 You find thousands of cool cafés where you can drink a coffee or caffè latte & enjoy kuchen with it. This means cakes, all sorts but especially cheesecakes, tortes, carrot cakes, etc. You name & they sell it. The 1st day, at the end of the day, we went to a special cheesecake shop & café. It is called: My cheesecakes! My Cheesecake, Ludwigkirchstraße 10, 10719 Berlin Open? Monday till Sunday from 8 AM to 8 PM. 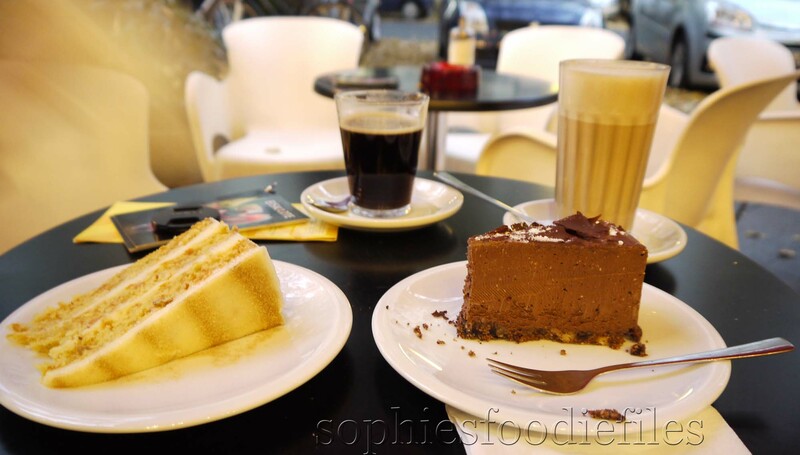 & on the right: a Philadelphia chocolate cheesecake with a caffè latte for me!!! yummy! So decadent, so good & so fantastic too! They say that they sell 17 different cheesecakes every day, per piece. That evening, it was already 7 PM, there were still about 7 different cheesecakes left. My husband chose the carrot cake with the marzipan layers. I tasted it & it was superb, heavenly lightly too. He also drank a strong coffee. I chose the Philadelphia chocolate cheesecake & I was one very happy woman! 🙂 A bit heavy though but superb! I drank a coffee latte with it. They also sell bagels, waffles, drinks, etc. Yummy too. We enjoyed it all, by sitting on the outside terrace with colourful blankets on our knees. You happen to see that a lot in Berlin, even in Fall time. It is lovely to sit outdoors with the comfy blankets to keep you warm. People don’t do that in Belgium. It all costed us about 15€. A lovely cheesecake café! They also sell bagels,waffles, drinks: hot & cold, etc! 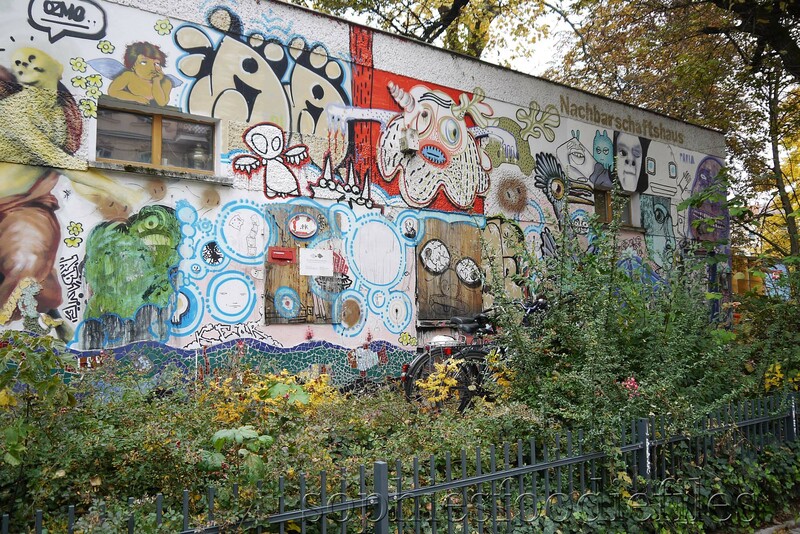 The next day, we went to the area of Prenzlauerberg. This is more of a quieter area with lots of families, small children & artists. You can find some cool cafés, lovely artisctic shops , wine bars & restaurants over here. You also can find a lot of cool second-hand shops, clothing & furniture too. On the way up there, we stopped at the U-bahn stop: Senefelderplatz. Just in front of you, on your left-side, you will see a large LPG-bio market over there. Adresse: Kollwitzstrasse 17, 10405 Berlin. It belongs to a chain of many large organic supermarket’s. We don’t have that brand of organic supermarket’s over here in Belgium. It was worth the stop! 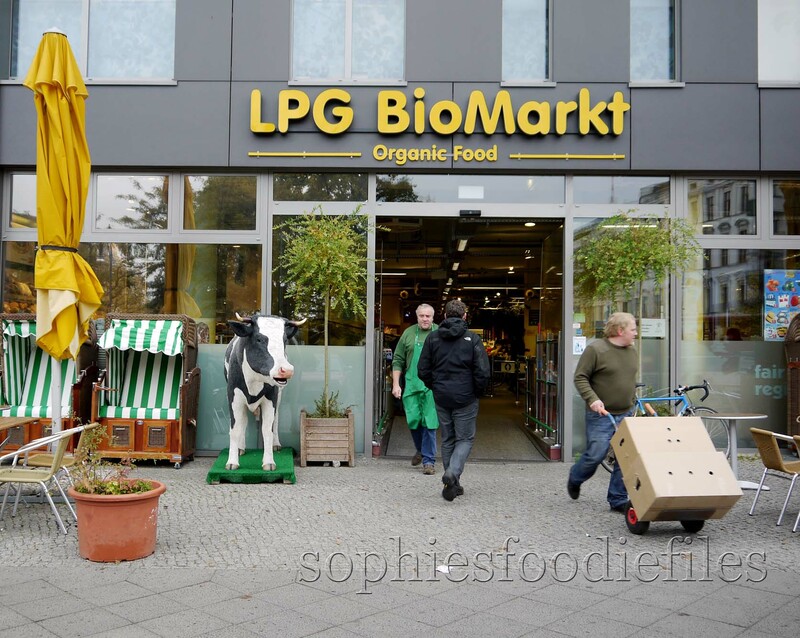 The products are about the same price as in our organic shops in Belgium, like the Bio-Planet, bio-shop, etc! 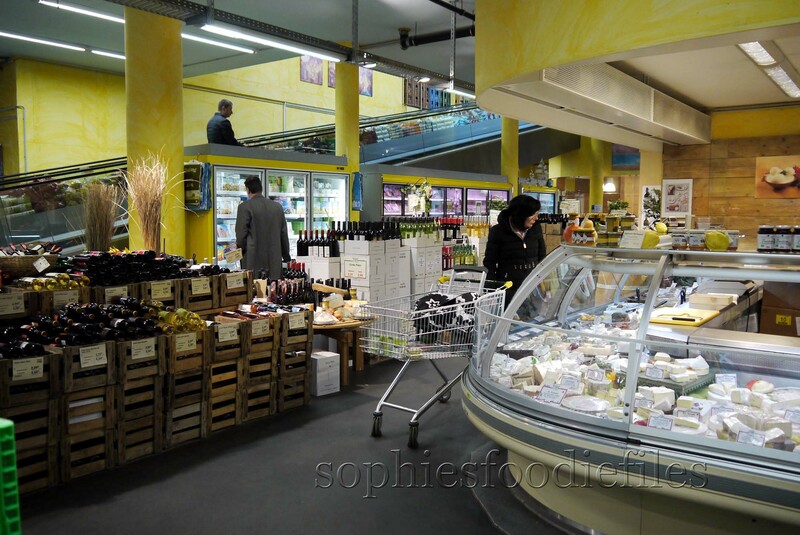 They also have large vegan section, in all categories, like plant-based milks, plant-based yoghurts, plant-based ice-creams, vegan burgers, vegan cheeses, etc. I was very impressed! Then, we went strolling around the streets in Prenzlauer Berg. 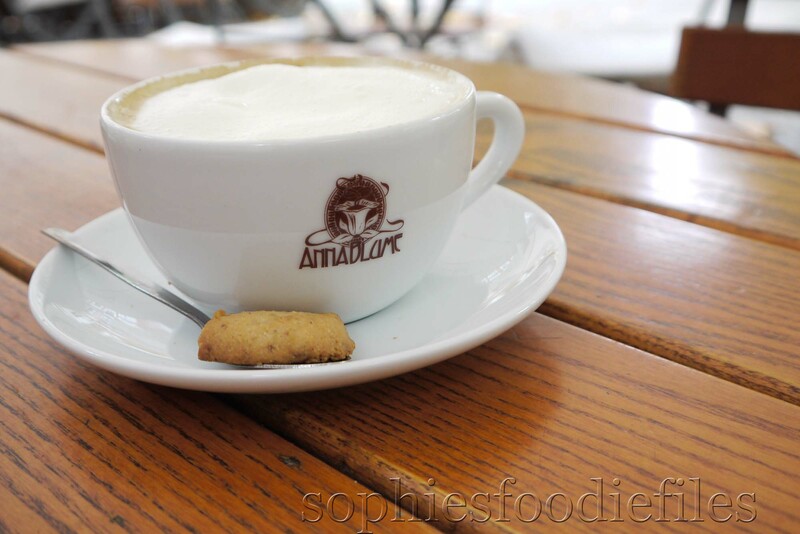 We went for a coffee & a coffee with steamed soy milk , for me, in café Anna-Blume. 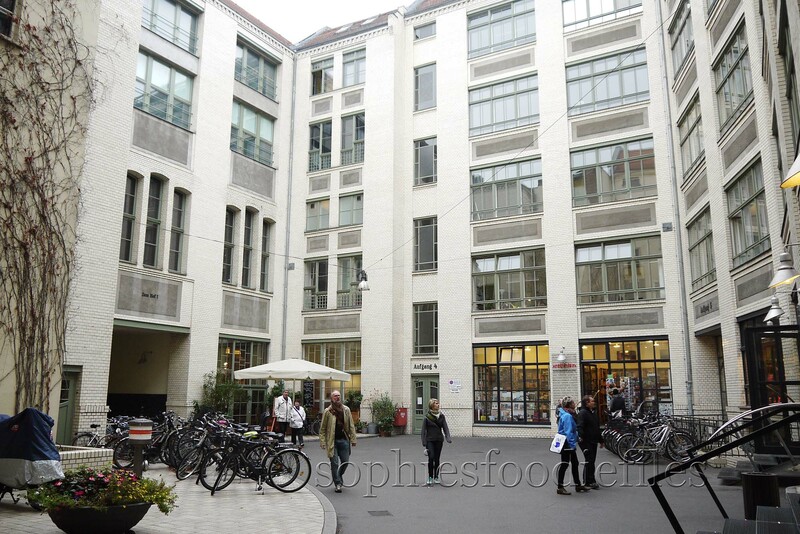 Here is the address: Kollwitzstrasse 83, 10405 Berlin. On one side it is a café & restaurant & on the other side it is a flower shop! They are famous for their culinary & floral specialties. We sat on the outside terrace with a comfy blanket on our knees, watching the world go by. For Sophie: A grand & large coffee with steamed soy milk & a home-made biscuit. In the same neighbourhood, we stumbled onto this lovely shop. Misses & Marbles, Raumerstraße 36, 10437 Berlin. 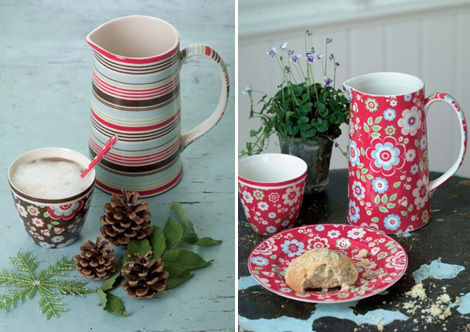 They sell a lot of fun things to use in the kitchen & lovely china from the Danish colourful brand: Green Gate. 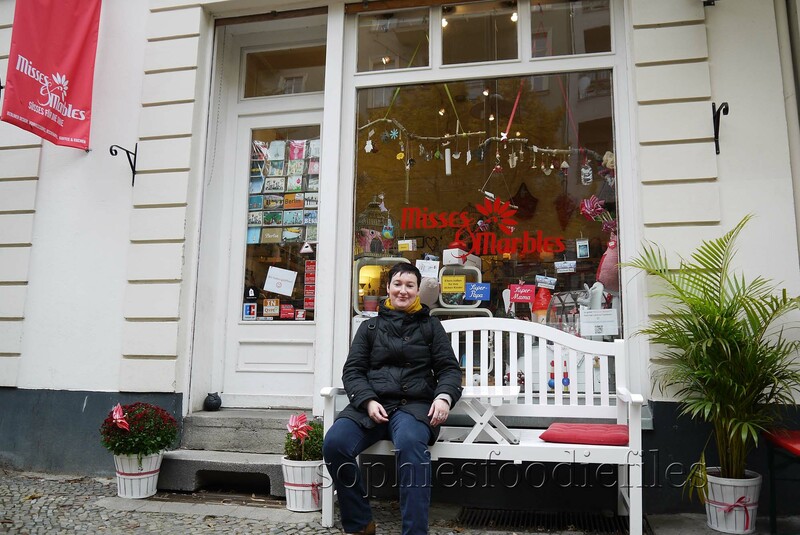 The lovely shop Misses & Marbles in Prenzlauer Berg! Green Gate porcelain: all very colourful! I bought a lovely cookie cutter of the famous TV-Tour. 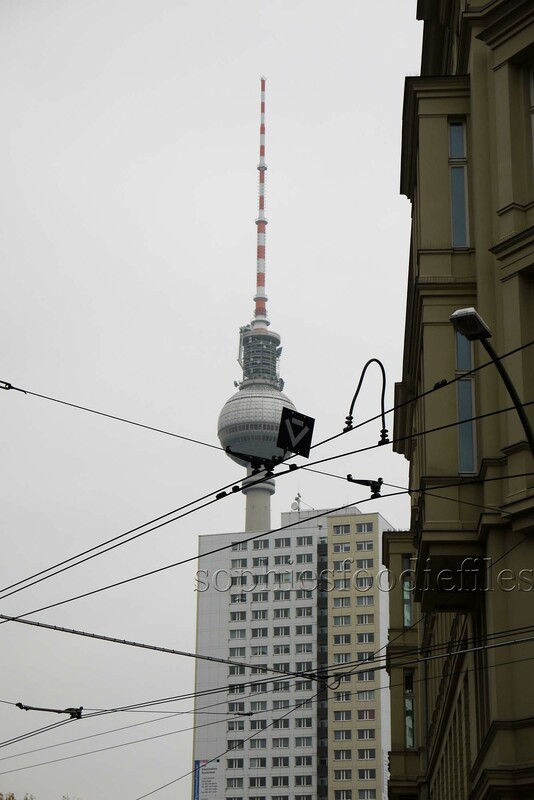 ( Fernsehturm ) You see this tv-tower all over the center of Berlin. It is located near the famous Alexander Platz! It is as famous as the Brandenburger Tor. This cookie cutter costed me: 6.90€. That’s a lot of money, I say! 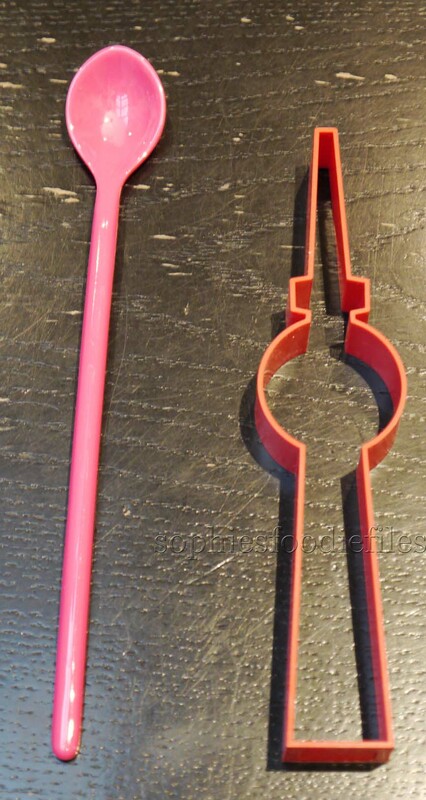 the size of my tv-tower cookie cutter! They also have a café besides the shop where you can drink a coffee latte & eat a lovely piece of cake. We didn’t do that because we just had coffee @Anne Blume above. 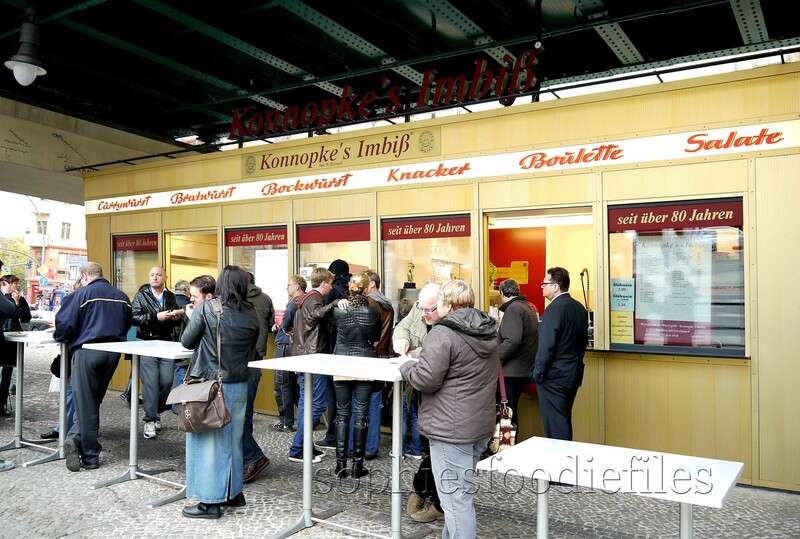 We walked further and we were a bit hungry, then we arrived at one of the most legendary currywurst-Institutions of Berlin: Konnopke’s Imbiss, Prenzlauer Berg, Schönhauser Allee 44 B, 10435 berlin. U-Bahn: Eberswalder Strasse, under the dark green bridge. They only sell the currywurst ohne darm, without the darm. They also sell other type of sausages. 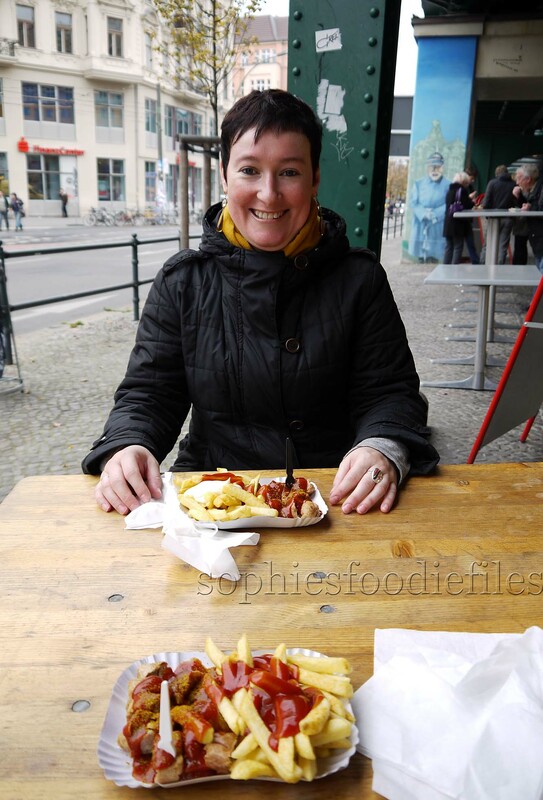 People in Berlin snack on curry wurst on the go, instead of going to the friteries, like they do in Belgium. You see other brands all over Berlin. Open? Monday till Friday: 10 AM til 8 PM, Saturday: 12 PM till 8 PM. Sunday closed. They also have another Imbiss, somewhere else in Berlin. See their website, above. It costed us 2: 6€. The curry-wurst institute of Berlin! For more than 80 years! 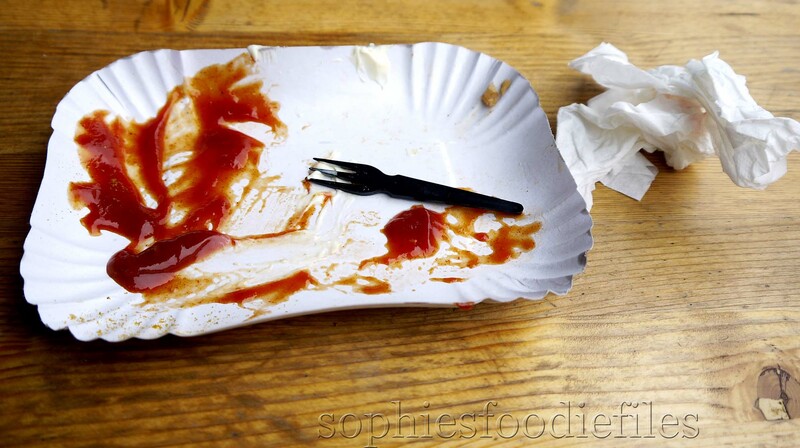 The classic menu: curry wurst with fries & ketchup with curry powder! Later on, we visited the Hackesche Höfe, Rosenthalerstraße 40/41 & Sophienstraße 6,10178 Berlin , a labyrinth of beautiful inner patios, with lovely renovated buildings, in Jugendstil. Inside these höfes are very expensive & alternative fancy shops. The Inside of one of the Hackesche Höfe! Sophie at one of the inside of the Höfe! Then, later on, we were getting hungry & I wanted to go to Barcomi’s Deli. My guide said it was in one of the höfe but it was & it wasn’t. It was in another entry in an adjoining street. It was difficult to find but we found it finally, after asking the way. 🙂 Barcomi’s Deli, Sophie-Gips-Höfe 21, Sophienstrasse 21, 10178 Berlin. There is also a deli in Kreuzberg, Berlin. 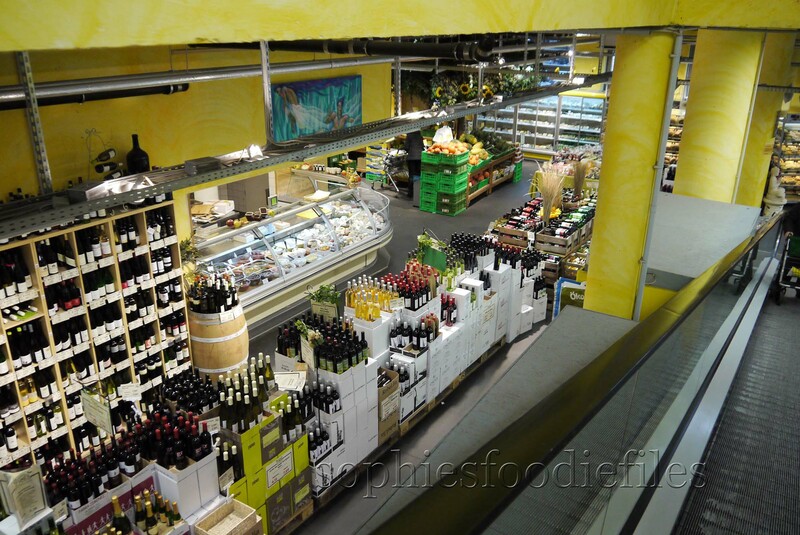 Barcomi’s Deli is founded by an American woman, called Cynthia Barcomi. 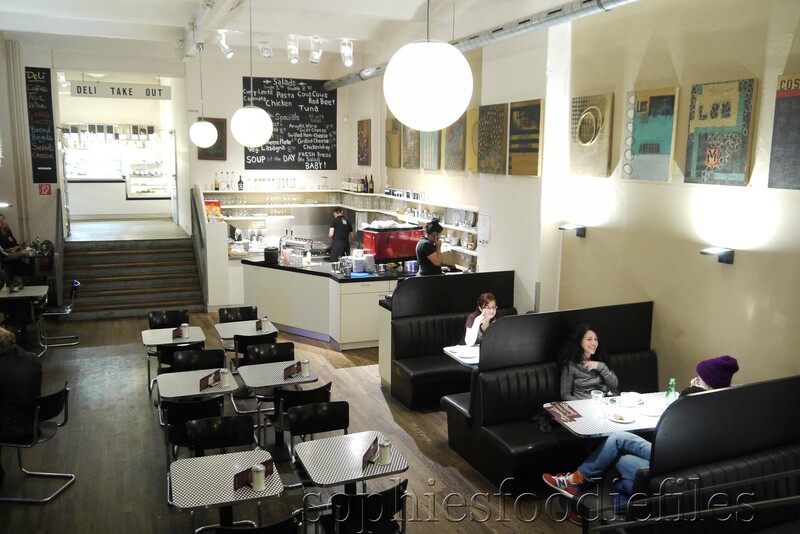 A lovely interior in Barcomi’s Deli! Vegetarian lasagna with salad for me! My husband had the spicy chicken wraps with also a salad. I had 500 ml of Paulaner beer. Peter loved his dinner & his lovely glass of red wine. ( no picture here ) A delicious meal! 😉 We payed for this all: 21.10€. So, this is the end of travelling Sophie: Berlin part 1! I hope you all enjoyed it! 🙂 See you all later! Stay tuned, Subscribe by email through the link below to get my new cool newsletters aka posts! Join 1,850 email Subscribers! It is free! Previous Post The Virtual Vegan potluck & my recipe in it: Vegan beetroot, pear, gherkin sour veganaise salad with home-made veganaise! Next Post A quick & easy pasta! Thanks for sharing! Seems you had a great trip! The cheesecakes looks really delicious! thanks, this is only part1 !!! 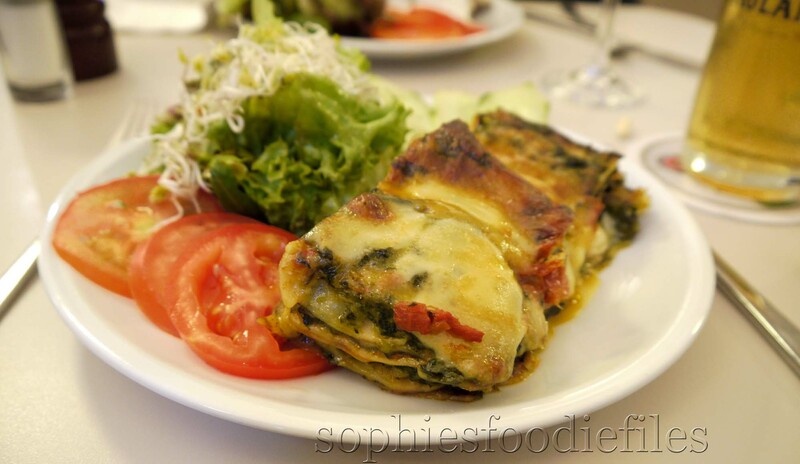 Sophie…it sounds like a wonderful holiday, and the food sounds amazing too! Can’t wait to read more, thanks for sharing! Yes, it was a great vacation! We loved it so much! Hi Sophie – Thanks for sharing your photos with us. I have never been to Berlin and hope to visit there some day. This was only part 1! More to come later one! I want to go to Berlin now! What a perfect time of year to go; it looks so pretty! Looks like you had an amazing time 🙂 wish I’d known about the cheesecake place when I visited, it looks delicious! I will tell you about vegan eateries & other cool places to visit in part 2 & part 3! 🙂 Thanks, Koko & wait for part 2 & part 3 , when I post about my vegan experiences in Berlin: ooh yes! Lovely. It’s Sunday morning here, and I’m sitting with coffee in hand, reading about your travels. Better than reading the newspaper! Love learning about snacks in different parts of the world – curry worst sounds pretty good to me! Misses and Marbles looks gorgeous, and I’m impressed you found a höfe called Sophie. That was a very lovely shop! I could buy anything in that shop to take home with me! Looks like you’re having a wonderful time…delicious one too! Love the new cookie cutter! I comletely agree! Wait for part 2 & 3 & 4!! Great photos, Sophie. Sounds like you had a great time! We surely had & it was a great vacation! looks amazing, I love exploring new cities! Loving that cookie cutter, fun! hahahaha! 🙂 It was’t bad! What a lovely post, thanks for sharing your trip with us! It makes me miss Germany so much. I cannot wait to see what else you did on your trip. So jealous! What a fun holiday. I love that you shared this with us! Thanks, tammy & part 2, 3, 4 will follow! I love Berlin, thanks for the great tips, these will definitely come in handy on my next trip! There is still a part2,3 & 4 that will follow! Developing into an interesting and well-writing travelling journalist? Waw! What is a POW? Thanks & there will be a part 2, a part 3 & 4! I love it Sophie! The cup of coffee looks so comforting. What fun to travel and eat!!! Thanks, Valentina! 🙂 There will be a part 2, 3 & 4! Thanks, Linda! I just published part 3! Yummy looking pasta, and fabulous trip you took. We have an exchange student for the whole school year and she is from Germany. We are love having her and learning more about her culture and her learning about ours. That’s great news for you all! Can you speak German a bit? Now, wait for part 2, 3 & 4!!! I loved, loved every word and picture on this post!! 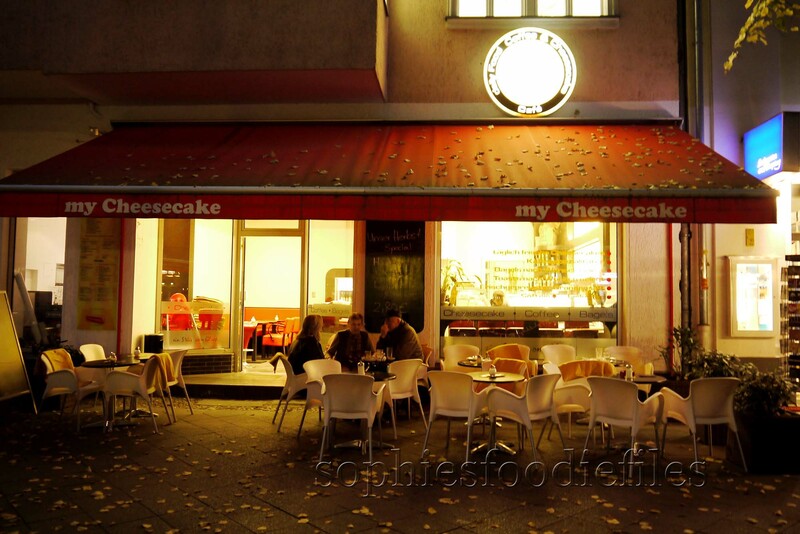 Especially the night time photo of the cheesecake place and inside the market and you with your french fries– and the beautiful Unter den Linden photo. I’ve always wanted to go to Berlin– can’t wait for your next Berlin post. thanks. Thanks so much, Rhonda! 🙂 Enjoy it all!! Seventeen kinds of cheesecake? I would come home fat as a rat. It was very cold there. It was frezzing below zero°C! – 5 °C! etc! Thanks! You are very lucky, living where you live in Florida: sunshine all the way! 🙂 Enjoy, part 2, part 3 & part 4! I hope you bought some of those cute porcelains. I’m drooling at the photos! yes, I could buy everything in that lovely shop!